At this point there is no question that gingham is the print of the season. It seems as if you can't walk into a store without seeing it hanging on multiple racks, and I'm not complaining. Despite the print taking over this year's trends, it still feels classic enough to wear at any time, in any place. With the start of summer I shamelessly went on a slight gingham binge, adding everything from a mini skirt to a neck scarf in the playful print to my cart. Today I'm sharing two ways I've worn the trend recently for both work and weekend. For anyone else with a surplus of black and white in your wardrobe, styling this print is a no-brainer. I personally love that it can be paired to match almost anyone's personal style, whether simple or quirky. Next I may have to venture into some color variations.. The summer heat has officially hit New York, bringing a welcome to the long-awaited beach season. Growing up a Jersey girl I've only been familiar with its infamous shores, but this past weekend my friends and I ventured out to Long Island's Fire Island for the first time. Despite the two-hour journey of trains, a shuttle, and ferry, I would return to Fire Island in a heartbeat. As an island completely without cars, it truly feels like an escape from the city. We spent the day in Ocean Beach, known as the "cosmopolitan" center of the island. We drank frosé by the seaside and lounged at ease under the sun, making for a perfect start to this New York summer. Just another evening of doing what one does when arriving early to dinner... taking photos against random apartment buildings, of course. Just around the corner from our hotpot dinner was this corner that quietly served as the perfect backdrop for some outfit photos. Despite needing frequent breaks from the city, there is no other place teeming with as much character at every step. New York's Lower East Side is has this imperfectly cool vibe that lets you breathe when the madness of Manhattan starts taking over. It feels darker and more unrefined than its neighboring areas while still holding some of the best spots in the city, making it a reminder that imperfection builds character. Maybe I'm just using that as an excuse for my realization that our Lyft ride left seatbelt marks on my top (oops). 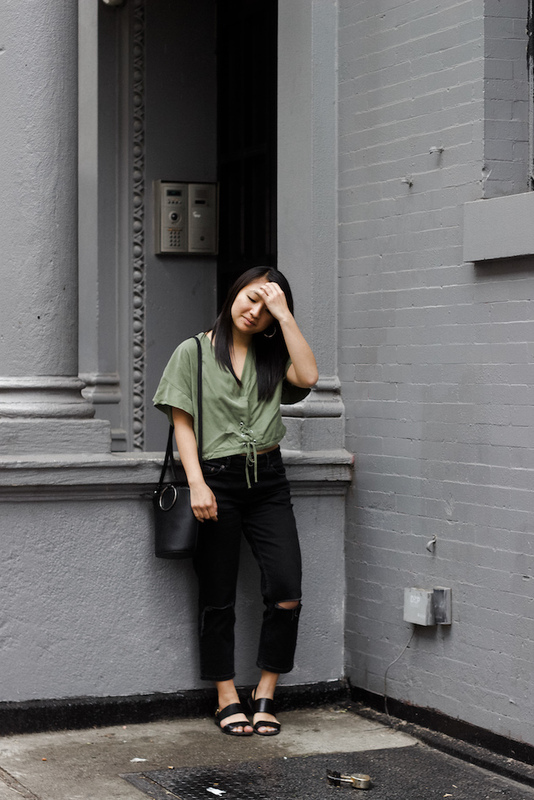 Or maybe it's totally okay to have a wrinkled gash down my top while walking the streets of a neighborhood that still carries New York's authentic grit. I'll go with the latter.